Geographically Crowfield village is approximately 9 miles (14 km) NNW from Ipswich, the county town of Suffolk. In 2012, the village was estimated to have around 200 households. It is believed that Crowfield was established in Saxon times not far from where All Saints Church now stands. The settlement was recorded in Old English as Groffeud or Groffeld, implying that it was just a croft-field (a small enclosure). Its written form began to change to what it is now following the Norman conquest of England that began in 1066. 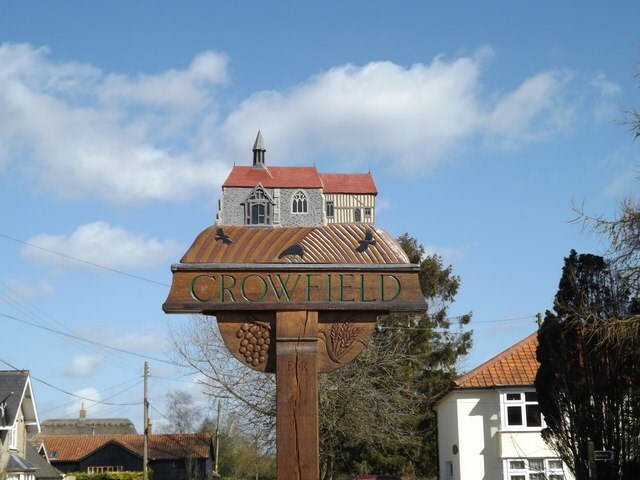 In the Domesday Book of 1086, or more accurately in East Anglia, 'Little Domesday', Crowfield was recorded in Latin as Crofelda. In later records we find this has become Crofield and although it is not clear when the 'w’ was first added, the parish register of 1784 records the 'Hamlet of Crowfield'.